The Tampa Bay Lightning's Radko Gudas (left) and Ondrej Palat will play for the Czech Republic in next month's Sochi Olympics. 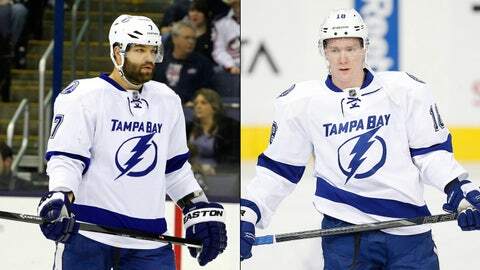 TAMPA, Fla. — Radko Gudas and Ondrej Palat are two different personalities. Gudas, a defenseman, is articulate and someone whose flamboyant approach to life is evident in the way he skates. Palat, a winger, is collected and someone whose reserved disposition makes him a business-first, behind-the-scenes presence who’s trying to make his impact felt in the NHL. Together, the two Czech players complement each other in the Tampa Bay Lightning’s quest to clinch a postseason berth. They will also represent their homeland next month at the Sochi Olympics, a shared destination that fits within a shared journey that includes humble beginnings but has led to hockey’s most prominent stage. "If you trust him off the ice," Gudas said earlier this week, "you will trust him even more on the ice." "It’s going to be awesome," Palat said of representing the Czech Republic in the Olympics with Gudas. "I’m glad I’m with him on the team." The NHL is a collection of histories and influences. Perhaps more than any other professional league in the United States, given the international flavor in a typical dressing room, the league shows that players with varied backgrounds can unite to chase a goal. The pursuit of a Stanley Cup is larger than language barriers, socioeconomic differences, even contrasts in personality. Observing Gudas and Palat from afar, little about the pair is similar. Gudas, 23, resembles a hearty lumberjack with his thick beard, while Palat, 22, is clean-cut with his smooth face. Gudas has no shortage of charisma, while Palat is more hesitant to become vulnerable to someone who’s unfamiliar to him. This yin-yang relationship is part of the Lightning’s chemistry that has allowed coach Jon Cooper’s team to rise to a tie for second place in the Eastern Conference with 65 points. The two players were familiar with each other during their junior hockey days, but a connection strengthened when they shared a beachside house with a pair of other teammates during the 2011-12 season as part of the American Hockey League’s Norfolk Admirals. The house — in many ways — set in motion the comfort Gudas and Palat have found as part of the Lightning. They surfed together. They fished. There was the occasional party. "Yeah, we had some," Palat said. "We had fun." Added Gudas: "Can’t say a bad thing about that season." It’s only fitting that their career arcs continue to be shared. Both made their debut with Tampa Bay last season, and they have fewer than 70 NHL games to their names. Gudas has 20 points and 16 assists in 68 contests. Palat has 30 points and 17 assists in 65. "That relationship helped three years ago, in the minors," Cooper said. "That’s when that kind of helped Palat, helped Gudas, helped everybody. Probably more so Palat, because he’s more the behind-the-scenes shy guy, where Gudas has more charisma. Palat just goes about his work. … Gudy is more flamboyant. I think that helped Palat." The help goes both ways, because trust is a key currency in the NHL. During their time together in that beachside house, Gudas and Palat formed more than an awareness of a shared home country. They learned each other’s quirks and tendencies, a development that has assisted them in their NHL transition. The bond reached a new phase earlier in January, when they learned they will represent the Czech Republic in Russia. On Jan. 6, they were playing soccer near the rink before a morning practice in Winnipeg when Gudas checked his phone to see if Olympic roster selections had been posted online. He scanned the screen for some closure, and then found it. "Palat," he recalls telling his teammate at the time, "we’re going to the Olympics." There were hugs. Congrats were exchanged. Mostly, there was a shared appreciation because of their history together. "It was awesome," Gudas said. "It was a great practice. I didn’t do much in the practice. I was overly excited." Added Palat: "When he found out, he ran into me, and he hugged me. It was pretty fun." Playing with Czech hockey legend Jaromir Jagr will be a dream come true for both. And for Gudas, he’ll retrace the footsteps of his father, Leo, who won a bronze medal playing for Czechoslovakia as a defenseman in the 1992 Olympics. Palat said natives of the Czech Republic have been "crazy for hockey" since the country beat Russia for the gold medal in 1998 at Nagano. Both he and Gudas remember watching those Olympics on television as boys with the family when a large graphic flashing on the screen announced they had won the Games’ largest prize. "Hockey in Czech is the No. 1 sport," Palat said. "It’s huge there. The Olympics are even better." Soon, Gudas and Palat will feel the sensation. They own two different personalities, but they are one in the same this way: They are dreamers chasing visions in the NHL and beyond. Gudas knows his fellow countrymen — and the world — will be watching him and his teammate, his friend, next month. With the attention comes a higher profile, more responsibility. "That’s something I’ve got to get used to a little more now," Gudas said with a short laugh. Not bad for a pair of players who, less than three years ago, were forming a bond by the beach in the minors. Chances are, he and Palat will be more than fine, just like always.